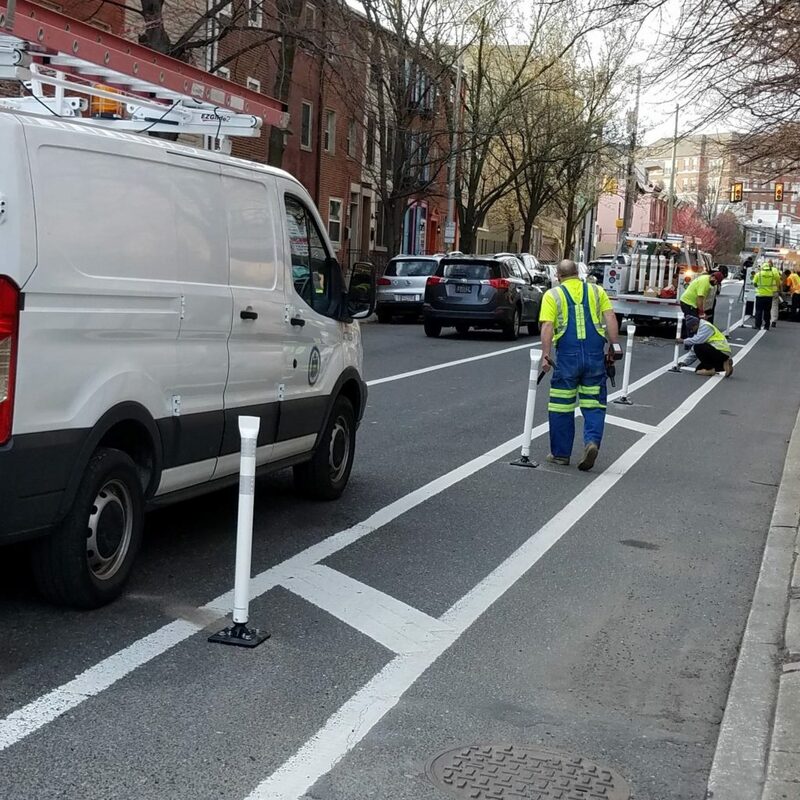 The City of Philadelphia installed protected bike lanes on South Street, between 27th and 22nd, and a portion of 27th Street, over the weekend. The new protection will make people who ride bikes safer coming off of, and getting onto, the South Street Bridge. The installation comes after a long wait, which officially began in summer 2017. That summer, a public meeting was held, asking residents about new protection of existing bike lanes, along South, 27th and Lombard Street. The project seemed like a no-brainer. The South Street Bridge is the most-biked bridge in Pennsylvania, with 455 people on bicycle crossing, per hour, during rush hour, according to the Bicycle Coalition’s latest bike counts. Given the number of bicyclists, and the speed at which motorists drive over the bridge, these areas seemed ripe for protection. Not everyone thought so. After some near-neighbor complaints, Councilman Kenyatta Johnson rejected protection along Lombard Street, though remained undecided on South and 27th Street. So, more than 200 people in Councilman Johnson’s district sent letters of support for the protected lanes, most of whom noted that they use the South Street Bridge on the regular (it is, after all, the most-biked bridge in Pennsylvania). The Bicycle Coalition held meetings and sent letters to the city with our recommendations for South, 27th, and Lombard Streets. The South of South Neighborhood Association wrote a letter in support, too. By December 2017, the City announced it would be putting in protection along 27th and South Streets. A Water Department project, however, put off the installation of flexposts by more than a year. And so, here we are. There are new protected bike lanes coming off the South Street Bridge and along 27th Street. 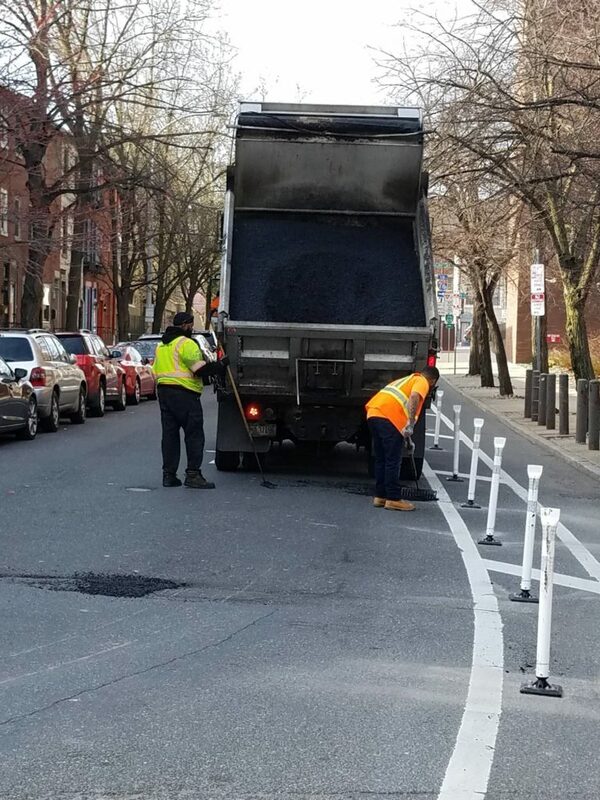 Thanks to the Philadelphia Streets Department and Office of Transportation, Infrastructure and Sustainability for completing this project. Next up: There are 11 additional protected bike lane projects coming to Philadelphia in the short-term. The next meeting for you to attend will be on April 16th at Palumbo Recreation Center. All information is available here. Let’s keep the momentum going.